The second project of the Practising Product designer module was the Sedna LED live project. Once again, the project was undertaken as part of a team. Our tutor for the project – Olivia Kotsifa, had invited a member of the Sedna LED design team in to give us an insight into the work Sedna produces, including their well known efficient LED strip based products. After being given an understanding of the company we would be designing for, we were given the brief, which was to create a lighting feature for a bar or club environment of our choice. Our team began by each researching a different location of our choice, then we collated our results in the form of mood boards. My location was the up-market bar on Windsor Place – The Buffalo Bar. The location proved to be a mismatch of different styles, all culminating into creating a unique atmosphere which projected an aura of class. I discussed my finding with the rest of the group, who had all been to different locations. Whilst we all liked the style of The Buffalo, we decided that it’s mismatch of styles would be prohibitive to design for and was counter intuitive for the use of modern technologies. We instead decided to focus more of our research on another bar within Cardiff city centre called Zero Degrees. The Zero Degrees bar included it’s own micro-brewery and restaurant section. The style was a perfect blend of modern and industrial styles, which in combination with Zero Degrees’ green policies, we felt matched the use of Sedna eco efficient LED technologies perfectly. Our research into what made Zero Degrees special included a tour of the brewery system and an in-depth conversation with the manager regarding the company’s ethics and style. Our main focus was the unique style of the bar area, which had large gauge pipes running down from the floor above to meet straight into the pumps. The pipes, although interesting as a design feature and practical as a system for drinks delivery, did seem to be underused. We decided to start thinking about lighting solutions that could combine with the bare pipe, in the hope that we could create something to harness the unused space, an idea that the manager and staff seemed to like. ALthough we had many solutions which simply illuminated the area, we decided to develop a design which utilised the pipe space as an advertisement area. 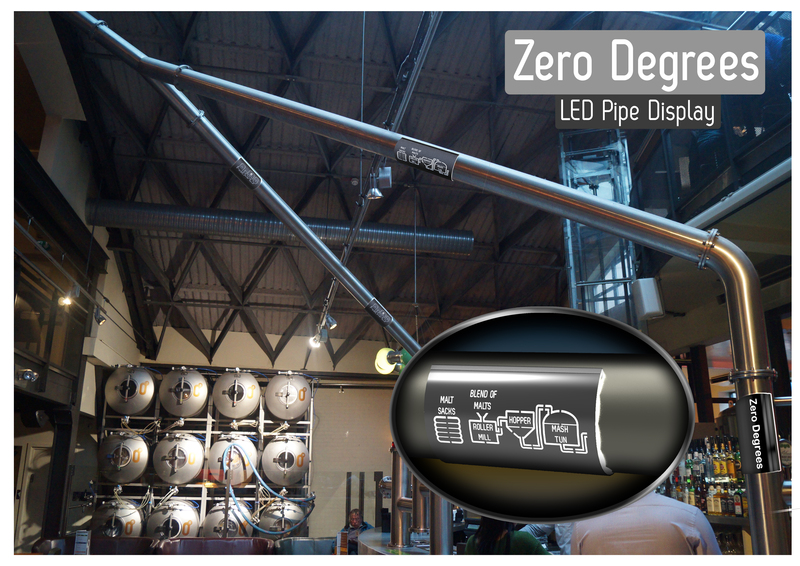 Our design could wrap around the pipe and then using the Sedna LED lighting strips, an acrylic sheet could be illuminated behind a precut, bent sheet of aluminium which had a variety of designs that visualised the brewing process as a stencil for the light to glow through. Our design was simply yet effective and had the ability to be grouped to create interesting flows of information. The lower power LED strips meant that the design was more eco friendly than conventional lighting systems, whilst the unique aluminium extrusions allowed the entire system to fit together easily yet also allow easy access to replace the outer panel. The Sedna LED live project was greatly enjoyable and I feel that our final design solution was unique and interesting. I found the task of technical design with the use of electronics was very educational and I definitely feel like this is an area of design I wish to pursue further.